Let's get real, I love fairy tale retellings. Whether it's Jessica Day George and Princess of the Midnight Ball or Robin McKinley and Beauty or many, many others, I can't get enough of them. 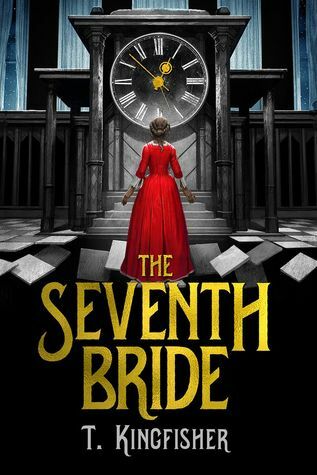 That is definitely why I purchased The Seventh Bride. It's a re-imagining of the tale of Bluebeard. I never thought anyone could successfully turn that particular fairy tale into a novel, but this author managed quite well. Rhea is the hapless seventh bride in this version. At fifteen, she's way too young to get married, something the character harps on incessantly. Sorry, but fifteen isn't that young. My grandmother got married at fifteen, and not because she had to. I thought the character's constant dwelling on how young she was felt off for a fifteen year old. Now, if she had been 12 or 13 that would have felt more appropriate, especially when she mentions that she isn't even getting her period regularly yet. Really? What fifteen year old is not menstruating? Also, yuck, do we have to talk about that? Moving on. The twist on the fairy tale is that most of the previous wives are still alive, or mostly so. There is a lot of dark magic in this book and it gets pretty convoluted. The Bluebeard in this book, Lord Crevan, is a magician who collects wives for dark purposes and he's chosen Rhea against her will. She agrees because she's a peasant and he's a lord and she sees no other way to save her family's mill. There are some good moments in this book. I liked the hedgehog and Maria was a strong character even though the names sounded way too similar on the audio version (Maria/Rhea). This is why you should read your stuff out loud. They look different on the page but are hard to keep track of when spoken. The tale is imaginative and I appreciated the lack of romance. I get really tired of romantic subplots. It's not flawless, however. I thought some of the phrasing felt too real world and not appropriate to the time and place. I also thought the resolution was a little off. Still, if you like fairy tales, I would give this one a try. But read Beauty and Princess of the Midnight Ball first, they're both much better. Four stars, at least one of which is for the hedgehog.